Pre- and post-war photographs adorn a wall of the “Exclusion” exhibit in the Presidio Officers’ Club in San Francisco. SAN FRANCISCO — “Exclusion: The Presidio’s Role in World War II Japanese American Incarceration” opened April 1 and will run through March 2018 at the Presidio Officers’ Club Heritage Gallery, 50 Moraga Ave. in the Presidio of San Francisco. 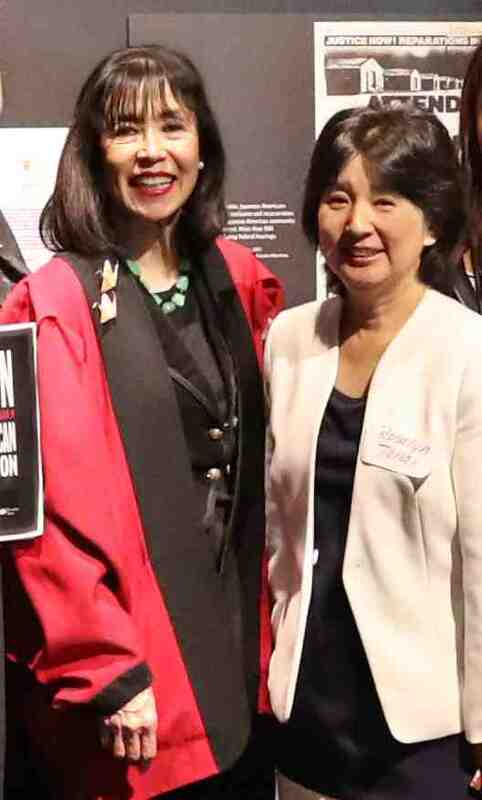 The exhibition is on view Tuesday to Sunday, 10 a.m. to 6 p.m.
Korematsu Institute Executive Director Karen Korematsu and National Japanese American Historical Society Executive Director Rosalyn Tonai. As headquarters of the Western Defense Command, the Presidio was the source of civilian exclusion orders and other military directives that enacted President Franklin D. Roosevelt’s Executive Order 9066. Together, these actions forced some 120,000 Japanese Americans from their homes along the West Coast and incarcerated them in concentration camps for the duration of the war. This special exhibition explores the Presidio’s significance in those historic times. 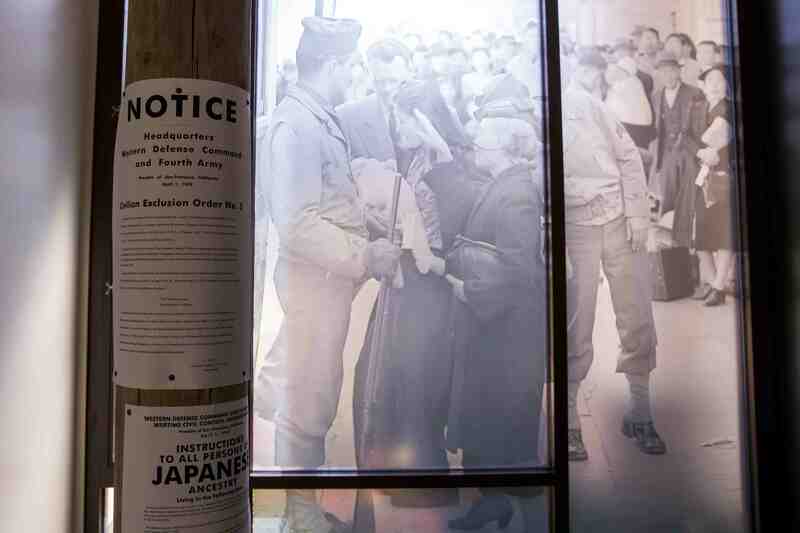 Replicas of civilian exclusion orders are tacked to a pole in front of a scene of Japanese Americans being transported from their homes. The exhibition marks 75 years since Western Defense Commander Lt. Gen. John L. DeWitt sat at his desk in Building 35 at the Presidio and signed 108 civilian exclusion orders to implement Executive Order 9066. The opening of “Exclusion” fell on the same day in 1942 that Civilian Exclusion Order No. 5 was posted throughout downtown San Francisco with the infamous “Instructions to All Persons of Japanese Ancestry,” directing the forced removal of all Japanese Americans. In developing “Exclusion,” the Presidio Trust staff worked with collaborators from the Fred T. Korematsu Institute and the National Japanese American Historical Society, both tenants at the Presidio. 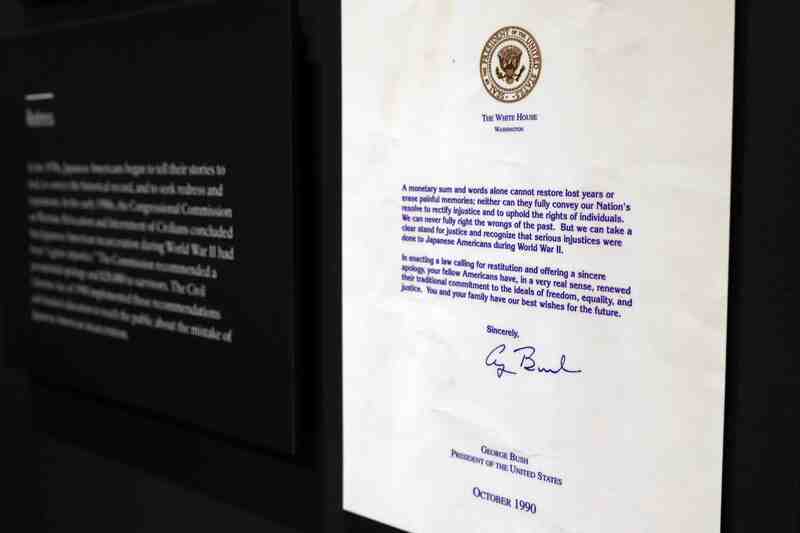 The Korematsu Institute and NJAHS provided input from concept development through script review, contributed objects and images to the exhibition, and are collaborating on public programming at the Presidio Officers’ Club’s Moraga Hall and school program development throughout the duration of the exhibition. 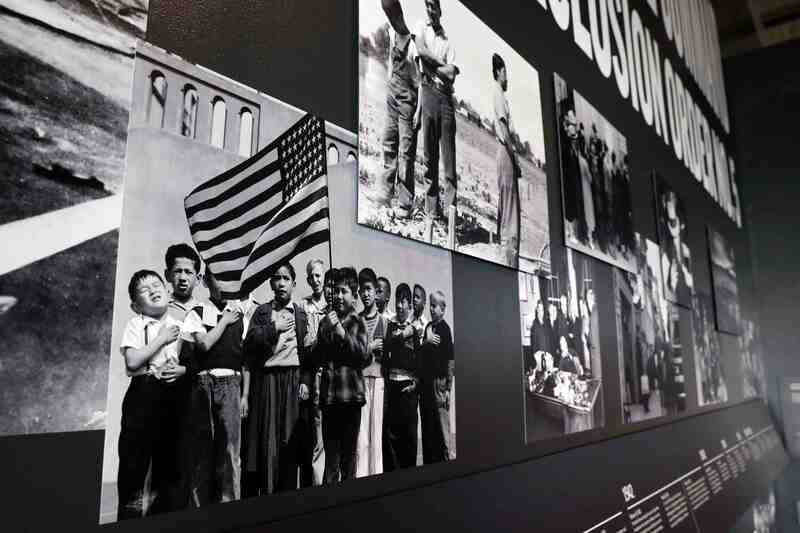 “Exclusion explicitly invites visitors to contemplate what can be learned from this shocking time in our history to help us contend with present-day issues — namely racial profiling, anti-immigrant sentiment, mass incarceration, and civil rights discrimination, as well as questions regarding the constitutionality of Executive Order 9066,” said Karen Korematsu, founder and executive director of the Fred T. Korematsu Institute. 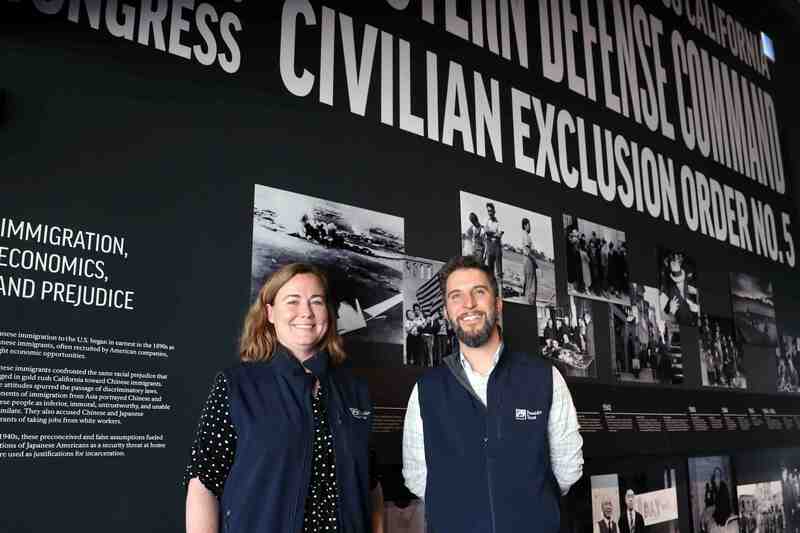 Presidio Trust Curator Liz Melicker and Eric Blind of the Presidio Trust stand in front of one of the displays of the “Exclusion” exhibit. A copy of the presidential apology that accompanied each redress payment to former incarcerees. The payments were authorized in 1988 but it took two years for the first checks to be issued. Opening Day activities included a panel with Dr. Stephen Payne, command historian at the Presidio of Monterey’s Defense Language Institute and Foreign Language Center; Richard Reeves, author of “Infamy: The Shocking Story of Japanese American Internment in World War II,” journalist, and senior lecturer at University of Southern California’s Annenberg School for Communication; and Don Tamaki, San Francisco civil rights attorney who served on the legal team that reopened the landmark U.S. Supreme Court case of Fred Korematsu, vacating his conviction for refusing to be incarcerated during World War II. They discussed the roles that the press, the military and the law played in the incarceration. There was also a “Children of the Camps” author panel with Stan Yogi, author of the children’s book “Fred Korematsu Speaks Up” (Heyday Books), and San Francisco native and former incarceree George Minoru Omi, author of “American Yellow,” first-place winner for in the memoir/life story category in a Writers Digest contest. Upcoming: “Letters from the Camps: Voices of Dissent” on Thursday, April 27, from 6 to 7 p.m. at the Presidio Officers Club. Using original letters from the camps, this interdisciplinary presentation focuses on Japanese Americans who spoke out during and after their incarceration, read by contemporary descendants, writers and performers. For more information, visit www.presidio.gov/exclusion. 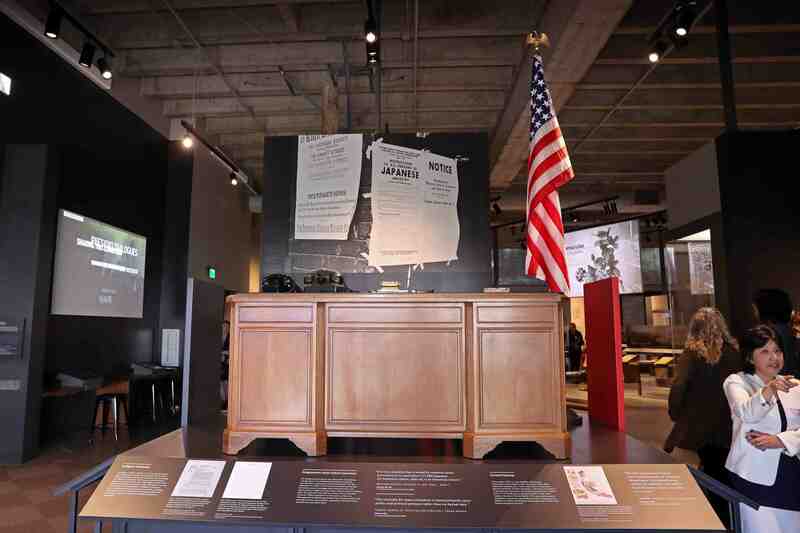 A 1940s-era desk, a representation of the orders that were signed at the Presidio by Lt. Gen. John DeWitt to send Japanese Americans to the camps, sits in the center of the “Exclusion” exhibit. In addition, NJAHS is presenting “Children of the Camps” through June 30 at the MIS Historic Learning Center, 640 Old Mason St., Crissy Field at the Presidio, Saturdays and Sundays from12 to 5 p.m.; and at the NJAHS Peace Gallery, 1684 Post St. in San Francisco Japantown, Monday through Friday and first Saturday of the month from 12 to 5 p.m. NJAHS presents National Archive photographic images by Dorothea Lange, Clem Albers, and others taken of children during the exclusion, removal and incarceration, two-thirds of them American-born citizens. NJAHS is a 501c(3) nonprofit organization, incorporated in 1981, and dedicated to the collection, preservation, authentic interpretation, and sharing of historical information of the Japanese American experience for the diverse broader national and global community. NJAHS strives to be a catalyst for change through cross-cultural awareness by learning from the past and influencing the future. NJAHS is based in San Francisco with its core programs conducted at two sites: the NJAHS Peace Gallery & Archives at 1684 Post St. at a convenient storefront location along Japantown’s commercial corridor, and the Military Intelligence Service (MIS) Historic Learning Center, Building 640, 640 Old Mason St., Crissy Field in the Presidio within the National Park Service’s Golden Gate National Recreation Area. The Korematsu Institute promotes the importance of remembering one of the most blatant forms of racial profiling in U.S. history, the incarceration of Japanese Americans during World War II, by bridging the Fred Korematsu story with various topics in history, including other civil rights heroes and movements, World War II, the Constitution, global human rights, and Asian American history. The institute makes connections to present-day civil rights discrimination and political scapegoating, such as mass incarceration, anti-immigrant sentiment, and Islamophobia. In 2009, institute was founded to honor Korematsu’s legacy. It was originally a local community and education program whose vision changed in 2010 as a result of Fred Korematsu Day of Civil Liberties and the Constitution being established in California on Jan. 30 in perpetuity. It has since become a national organization that inspires others through the Fred Korematsu story. The Presidio Officers’ Club is San Francisco’s most historic building and now the Presidio’s museum, with cultural events, food, and family fun. The museum features engaging exhibitions inspired by events that shaped the Presidio and influenced the nation. Special exhibitions explore the Presidio’s heritage and allow for fresh perspectives and a deeper exploration of the topics and themes presented in the museum’s permanent exhibition. Exhibitions explore how and why the past matters and inspire civic engagement by fostering an understanding of how the Presidio’s heritage is relevant today. Weekly programs include live music, talks, films, and family activities — all free to the public. The museum is also a wonderful place to gather, featuring Arguello, a Mexican restaurant by award-winning chef Traci Des Jardins. The Presidio Trust is an innovative federal agency created to save the Presidio and employ a partnership approach to transform this former military base into a new kind of national park. Spanning 1,500 acres in a spectacular setting at the Golden Gate, the Presidio now operates without taxpayer support, is home to a community of residents and organizations, and offers unique recreation, hospitality, and educational programs to people throughout the San Francisco Bay Area and the world.